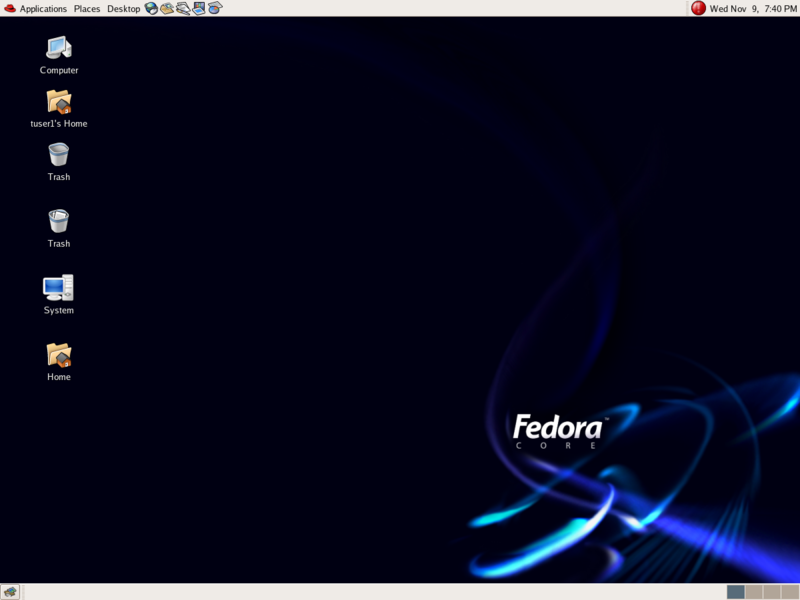 Most Red Hat and Fedora Linux distributions are configured to use GNOME as the default desktop. If this is the case with your computer, your desktop may look like Figure 5 the first time you login. It is easy to change to the KDE desktop. Figure 1: The default GNOME desktop. If your desktop looks like this (note the application bar at the top of the screen) you will want to make KDE the default desktop. Your background may be different. To make KDE your default desktop, logout of GNOME if you have already logged into it. Do this by clicking on the Desktop menu item on the application bar at the top of the screen. This opens a drop-down menu and you should click on the Log Out menu item; click on the OK button when the little confirmation window pops up. This will take you back to the login screen shown in Figure 1. Click on the word Session at the bottom of the Login screen and then choose KDE by clicking on the KDE radio button as shown in Figure 6, and then clicking the OK button. At this point you can begin the normal login process. Enter your account ID and password as described earlier in this chapter. You will now see another window that asks whether you want to make KDE your default Desktop. The options are “Just For This Session”, and “Make Default”. Clearly, for the purpose of this book, you will want to click on the Make Default button. Your login will continue and you will be logged into the KDE desktop. Figure 2: Select KDE using the radio buttons on the "Choose a session" pop-up. Of course if you ultimately decide to try GNOME, you can always switch back to GNOME for a single session, or you can make GNOME the default desktop by using the same procedure described here but by choosing GNOME instead of KDE. One of the things I really like about Linux is that there are so many choices available and making one choice now does not mean that choice is irrevocable. You will find it more comfortable to experiment with Linux during the rest of this book if you remember that any choice you make can be undone or changed back as easily as it was done in the first place.